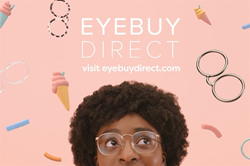 J. Walter Thompson partnered with EyeBuyDirect, an online eyewear retailer, to launch a brand new, multi-platform campaign. The campaign is comprised of a multi-platform approach to content, including 3D animated characters and real people. J. Walter Thompson (JWT) has partnered with EyeBuyDirect to launch a brand new, long-term brand campaign entitled “It’s How You Frame It.” The campaign is comprised of a multi-platform approach to content, including 3D animated characters and real people that enter fanciful worlds to showcase the fashion and function of EyeBuyDirect’s glasses. JWT brings its expertise in building iconic world-class brands to EyeBuyDirect’s exciting offering. As a digitally native, vertically integrated brand, EBD has made great strides in making eyewear and eyecare more affordable to the masses while not compromising on quality or style. With the “It’s How You Frame It” campaign, JWT aimed to help EyeBuyDirect (EBD), an online eyewear retailer, stand out in a cluttered category and increase its share in the U.S. market. EBD offers solutions for protection and correction at a very economical price point. EBD and JWT partnered together in early 2018 and are set to launch the campaign on June 18. Employing a borderless global team that went coast to coast and around the world via JWT and extended WPP members, they exemplified a cohesive team working together on a unified vision for EBD. Driven by the simple idea that it shouldn’t cost the Earth to protect one of our five essential senses, the new campaign brings to life the brand’s consumer-centric philosophy while infusing the category with much-needed energy and optimism about the possibilities that eyewear and eyecare bring to each individual. EBD’s philanthropic ethos extends to having donated over 435,720 pairs of eyeglasses from 2011 to May 2018 and 368,888 from 2015 to May 2018, applying EBD’s “vision for everyone” philosophy. “We are super excited to work together with JWT on this amazing project and have been impressed by the agency’s efficiency and professionalism. We are looking forward to many years of partnership ahead,” said Sunny Jiang, CEO, EyeBuyDirect. The “It’s How You Frame It” campaign is a fusion of brand ideas, integrated storytelling, content creation and analytics that demonstrates what is possible when the creative minds of clients collaborate and unify their vision with their agency. EyeBuyDirect was founded by Roy Hessel in 2006 and has been part of the Essilor Online Division since 2012. With millions of customers annually, EyeBuyDirect continues its mission to provide easy access to affordable corrective eyewear, with a complete pair starting at $6. Learn more at: https://www.eyebuydirect.com/. J. Walter Thompson (JWT) has been at the forefront of advertising for over 153 years, constantly evolving and drawing upon our unique and innovative DNA to reimagine the future for our clients and our agency. JWT has always been first, changing the course of the future for ourselves and our clients. We aired the first TV commercial, launched the first global campaign, promoted the first female creative director, rocketed the first candy bar into space, created the first amphibious prosthetic limb, and taught a computer to “paint” a 3D “Rembrandt.” For more information, visit http://www.jwt.com or @JWT_Worldwide on twitter.